During WW II, when The Netherland was occupied by Nazis, Princess Juliana and her family fled to great Britain. One month later, the Princess and her two daughters sought exile in Ottawa, Canada, while her husband Prince Bernhard stayed behind to join resistance forces. On January 19, 1943, Princess Juliana gave birth to a girl in Ottawa Civic Hospital, who was named Margriet after a type of daisy that was worn by the members of the Dutch resistance at the time. Now, the problem was that based on the Dutch laws the future queen or king must have been born in the Dutch soil. 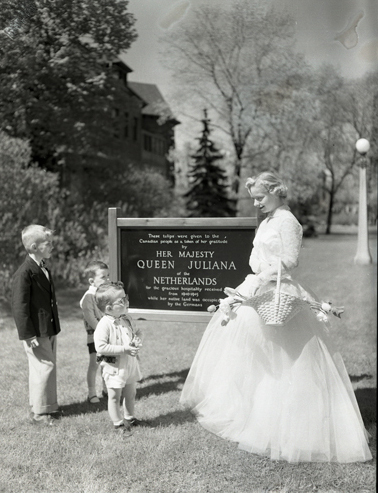 To solve this legal technicality, the Canadian officials declared the maternity ward to be officially a temporary part of the Dutch soil (some sources indicate they declared the ward a temporary part of international territory, so that she would be born in no country and would inherit only her Dutch citizenship from her mother). 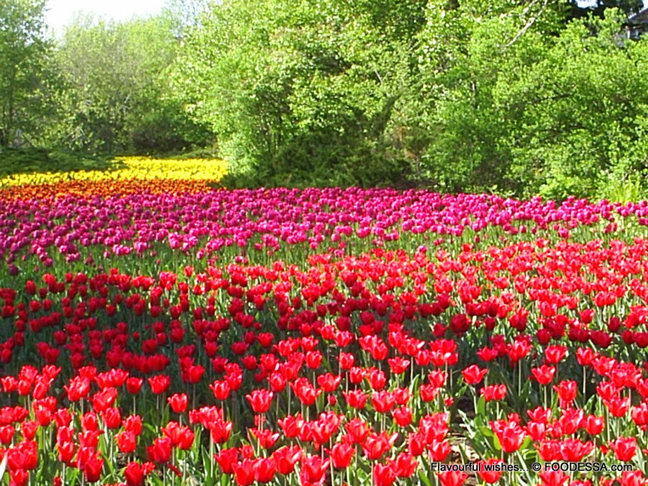 Either way, the problem was solved and the gesture was so appreciated by the Dutch government and people that in 1945, when the war was over and Princess Juliana and her family had returned home, they sent 100,000 tulip bulbs to Canada as a token of appreciation—and they continue to do so to this date. Soon Ottawa became famous for its tulips and in 1953 the Ottawa Board of Trade organized the first “Canadian Tulip Festival”. The Tulip Festival is held every year in May and is said to be one of the most beautiful tulips festivals in the world, with some 500,000 visitors each year. Queen Juliana returned to celebrate the festival in 1967, and Princess Margriet returned in 2002 to participate in the 50th anniversary of the festival. See gorgeous photos of this festival at Ottawa Tourism Site.